The molecular age has brought about dramatic changes in medical microbiology, and great leaps in our understanding of the mechanisms of infectious disease. Molecular Medical Microbiology is the first book to synthesise the many new developments in both molecular and clinical research in a single comprehensive resource. This timely and authoritative three-volume work is an invaluable reference source of medical bacteriology. Comprising more than 100 chapters, organized into 17 major sections, the scope of this impressive work is wide-ranging. Written by experts in the field, chapters include cutting-edge information, and clinical overviews for each major bacterial group, in addition to the latest updates on vaccine development, molecular technology and diagnostic technology. Topics covered include bacterial structure, cell function, and genetics; mechanisms of pathogenesis and prevention; antibacterial agents; and infections ranging from gastrointestinal to urinary tract, centrtal nervous system, respiratory tract, and more. Medical microbiologists in training and practice, infectious disease physicians involved in research. Postgraduate students and above interested in molecular microbiology, microbiology, infectious disease, virology, and biochemistry. Plasmid or Bacterium, Which is Really Responsible for the Spread of Resistance? Why are Zoonoses Becoming Increasingly Recognized as a Problem? Dr. Yi-Wei Tang is currently the Chief of the Clinical Microbiology Service at the Memorial Sloan-Kettering Cancer Center in New York City, USA. He was a Lecturer and Clinical Fellow at the Mayo Clinic and Assistant Professor, Associate Professor to Professor at the Vanderbilt University School of Medicine. He has been engaged in medical and molecular microbiology translational researches, aimed at developing and evaluating new and advanced microbiological diagnostic testing procedures. 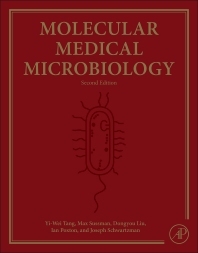 Dr. Tang ranks among the top of the scientific field in clinical and molecular microbiology, as evidenced by his election as an Editor for the Journal of Clinical Microbiology, an Associate Editor for the Journal of Molecular Diagnostics, and a Fellow of the American Academy for Microbiology and of the Infectious Disease Society of America. Dr. Tang has been recognized for his extraordinary expertise in the molecular microbiology diagnosis and monitoring with 156 peer-reviewed articles and 68 book chapters in this field during the past 20 years. Dr. Tang is a chief editor of a Springer book “Advanced Techniques in Diagnostic Microbiology” and a co-editor of two ASM Press books “Molecular Microbiology: Diagnostic Principle and Practice” and “Diagnostic Microbiology in Immunocompromised Host”.